Do you know that in blogspot that you can actually enjoy and generate traffic. To increase your blogspot visibility and get it ranked high in Google is what many bloggers on blogspot see to be hard. Been on blogspot also offers you the opportunity to enjoying what other bloggers in various platforms enjoys. Every blogger dream of high traffic and increase in earning. This can be done by attracting more visitors to you blog. How ? This tutorial answers that question. Cool down and read. Getting people read your work and visit your blog encourages you to put more effort. 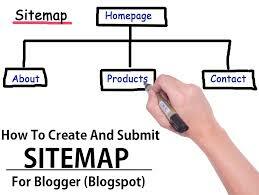 This tutorial, is on how to submit you sitemap to Google. In other to get your articles rank high on Google search engine.. Note that this tutorial is relevant to other bloggers please read and share. An complete sitemap file should mention all pages of a site but that’s not the case if your blog is hosted on Blogger. This section is valid for both regular Blogger blogs (that use a .blogspot.com address) and also the self-hosted Blogger blogs that use a custom domain (like postsecret.com). Here’s what you need to do to expose your blog’s complete site structure to search engines with the help of an XML sitemap. Open the Sitemap Generatorand type the full address of your blogspot blog (or your self-hosted Blogger blog). Click the Create Sitemap button and this tool will instantly generate the necessary text for your sitemap. Copy the entire generated text to your clipboard. Next go to your Blogger dashboard and under Settings – > Search Preferences, the enableCustom robots.txt option (available in the Crawling and Indexing section). Paste the clipboard text here and save your changes. you don’t have to ping them manually. PLEASE READ MORE FROM MY BLOG.